which provides essential vitamins and minerals. A natural and organic liquid broad spectrum supplement for poultry which provides essential vitamins for your birds. Fermented in a process that mimics natural digestive processes, and is therefore highly palatable and enjoyed by most animals. Often poultry feeds lack vital nutrients, and chicks can be at risk of vitamin B deficiencies which lead to Perosis (slipped tendon), an irreversible condition affecting the hock joints. Perosis causes the joint to gradually twist out at a hideous angle, leaving the chick permanently crippled and the best thing you can do for the chick is to cull it. Water containing vitamin supplements will ensure that Perosis does not develop in young chicks. 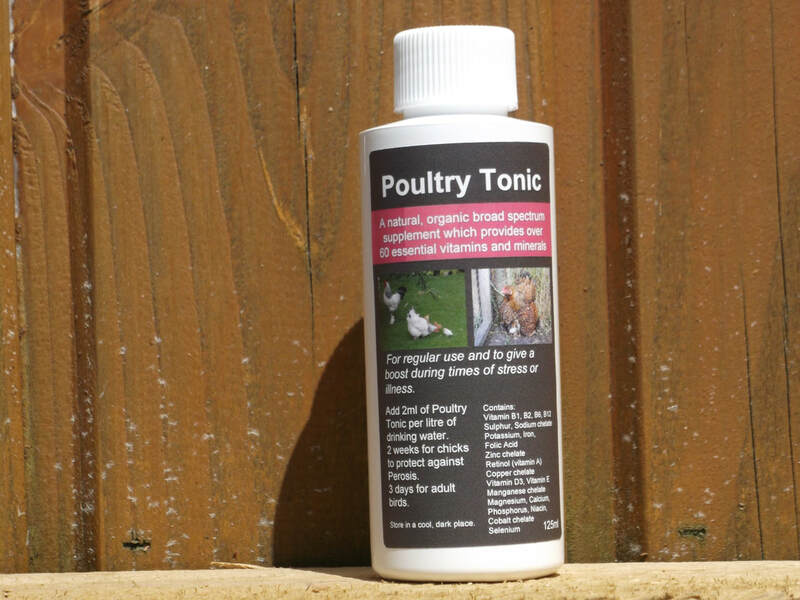 We have not had a single case of Slipped Tendon since using this product and we use and recommend Poultry Tonic for chicks and also adult birds who need a boost in times of stress, moulting or recovering from an illness. Can be added to a bowl of wet feed for adult birds (to give a concentrated dose rather than the wastage which can occur with water bowls). 125ml concentrate makes 62.5 litres. For chicks, add 2ml of Poultry Tonic per litre of drinking water for their first two weeks to treat your chicks through this critical stage when they are most vulnerable. For adult birds, add 2ml per litre of drinking water for 3-5 days to give them a boost during periods of stress or illness. Ideal to use as a general wellness tonic. We strongly recommend adding this to your fertile egg order so you have it on hand when your chicks hatch.